Tunneler is a top-down perspective game written in the early 1990s for DOS on IBM-PC compatible computers. Two tanks explore an underground realm, venturing from their protective bases to dig tunnels and find their opponent for battle. This game was novel in that it allowed two players to battle simultaneously on the same computer, with two windows and a shared keyboard. The game also used the “undocumented” CGA 160 x 200 pixel 16-color graphics mode. This entry was posted on 2013-01-12 by Geoff. The original IBM-PC Color Graphics Adapter (CGA) could display text in 16 colors, but supported only 4 colors when in color graphics mode (at a resolution of 320×200 pixels). It was not widely known that the CGA graphics card could also display a 16-color graphics, albeit at a resolution of only 160×100 pixels. Wikipedia has a good description of the technical details of this low-res graphics mode. Also, see Life Before Demos. 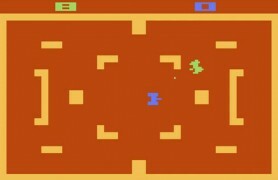 I think the concept of Tunneler was inspired by Combat for the Atari 2600 — two players fight it out in simultaneous battle. (Note the blue & green tanks.) I thought there weren’t enough concurrent two-player games for the IBM PC. 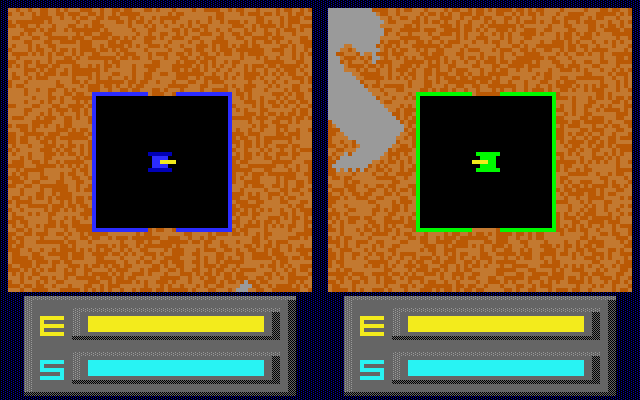 Tunneler was also an incremental step from a digging/mining game I had written for the TRS-80. 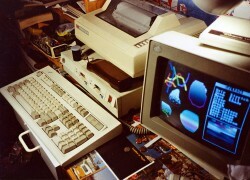 I wrote Tunneler in my spare time between 1989 and 1992 using my IBM PS/2 Model 30. Tunneler was developed using Turbo Pascal 4 and some hand-coded assembly. No, I no longer have the source code — it was stored on floppy disks that were lost or damaged over the years. This entry was posted on 2013-01-13 by Geoff. Here is a compilation of various Tunneler clones & remakes I’ve encountered. While the source code for Tunneler is long gone, it’s still possible to customize the game by hacking the TUNNELER.COM binary executable — if you’re handy with a binary editor! This entry was posted on 2013-06-17 by Geoff.